Hear what others have said about Dr. Mann’s products and services. A great source of information is his Digit Press Kit. You can see and hear directly from those who have worked with Dr. Mann. “Ron’s work is deep and wide. 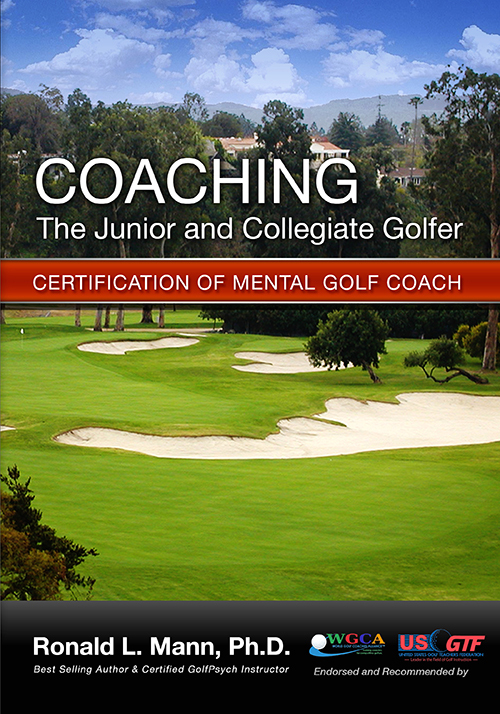 I think this online certification is a must for any age golfer who wants to use a more holistic approach to create a winning golf game. I am eager to have the opportunity to discuss with you the fine qualities of Dr. Ron Mann and how he has blessed my life and my corporation. Anyone so inclined is welcome to call me day or night at 480-239-1066. Pace Jordan Chairman/Co-Founder Dixon Golf Inc. I wanted to let you that I recently purchased your CD “Find The Zone”. I listened to it the other nite and took many notes. I played the other at my home course now, The Navy Golf Course at Seal Beach. I am a reserve in the navy. I played 7 previous rounds there and nothing lower than a 101. I had averaged 107 with all the scores. I took what notes I made from your CD and applied them the day I played. I went out there and blew all my stats away and also shot a scratch 87. I wanted to thank you for your time it took to make the cd and also teaching many things that I did not know. I truly believe in your teachings 100% plus. I recommend your CD to anyone that I know that plays golf. I just finished reading “The Yoga of Golf” and I must say I enjoyed it thoroughly! I have always been a proponent of using ancient Eastern Traditions to learn a skill. I found that using the Yoga techniques you described in the book an excellent way to relax my body and train my mind/body to play the best golf I am capable of. Just a short note to thank you for the copy of “The Zone.” I finally got the chance to sit down and experience it upon my return from Orlando. It is, unequivocally, the finest application of the mental side of this crazy game that I have listened to. As we discussed, I particularly related to the mental image aspects of the tape. Like many, I am certain that a golfer must first “see” a shot in his mind before he can properly ad consistently execute it. Beyond that, the golfer must believe they can hit the shot. From a personal standpoint, I know that my mental image of the shot on a par three tee is much more vivid than on the other shots. While I still don’t know exactly why this is, I feel that this tape will assist me in taking this tremendous asset to the other swings. Mancil Davis50 holes-in-one, the PGA world record. Executive Director of the National Hole-in-One Association. Great golfers are simply ordinary people who continually put themselves in a learning environment and are willing to risk the “tried and not-so-true” in the face of unpredictable outcomes. Ron Mann’s Find The Zone is that kind of learning adventure. He presents the golfer with the opportunity to play freely and creatively and to explore new horizons which may give benefits beyond the game itself. I would like to take this opportunity to express my enjoyment of the CD Dr. Ron Mann has produced. I have listened to and used the techniques covered in the CD. With these methods I have established a new outlook and approach to the game of golf. I have always been fascinated by the power that the mind has over the game. 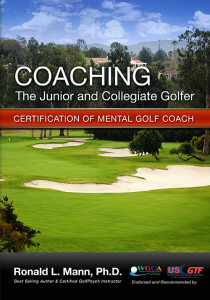 This CD and techniques included in it can benefit all levels of golfers. I would highly recommend the CD and would like to give my endorsement on the product. I feel that this area of the game and the focus on controlling the mind is the next step of advancing one’s game. Doug Hoffort Head Golf Professional MountainGate C.C. Dr. Ronald Mann has done the impossible! He single handedly changed my golf game forever. As an entrepreneur, Investment Banker and co-founder of the worlds leading environmental golf company it is imperative that I command dignity and respect on the golf course as that is where 90 percent of my business is done. In saying that, I was hardly where I needed to be on the course until I met the honorable Dr. Mann. I was having difficulties with my putting game so I asked Dr. Mann to join me for a round of golf so he could analyze my putting stroke. Immediately he told me that I had the “yips” and that I should try using the “claw” grip. After him working with me on a few holes to my amazement I was draining puts like never before. Although he’s a genius on the course, Dr. Mann’s true magic is off the course educating people on the most important part of game the “MENTAL” aspect. Dr. Mann invited me to attend one of his seminars at the prestige’s Gainey Ranch Golf Club in Scottsdale AZ. where he is a member. After 2 hours of mental conditioning and learning how to find the “ZONE” I went out the very next day and took first place in a prominent Charity event, I was astonished! What I learned in that 2 hours of instruction could never have been learned on the driving range or even taking golf lessons from a pro. I encourage anyone who wants to empower their game to a level that they never thought possible to engage with the incredible Dr. Mann, I promise you it will be a “GAME CHANGER”.